Outlandish Observations: Diana likes my sign! Great news about the ECHO paperback! The sign was a great idea <g>--and that's an excellent picture of you; you look so pretty and friendly, I don't know who could resist talking to you. And then she asked if she could use this picture on her redesigned web site. Wow! (Naturally I said yes.) I'm flattered and delighted that she likes it enough to want to use it herself. This is a great example of a last-minute idea that turned out to be Just Perfect. I went to a local craft store the day before our trip to Grandfather Mountain, bought the blue posterboard (the same color as the OUTLANDER paperback) and some gold-foil alphabet stickers, and it didn't take long to put it together. I enjoyed being a sort of "roving ambassador" for Diana's books at GFM on Friday. 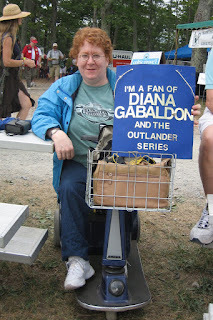 I'll definitely bring the sign with me when I see Diana at the Bookmarks Book Festival in Winston-Salem, NC, on September 11. I'd love to get her to autograph it for me! What fun! That WAS a really great idea. I really wanted to go to this - though me alone with 4 kids probably wouldn't have been much fun (my husband had to work this weekend). I will think about it for next year. I LOVE the Asheville area and the Blueridge mountains. An autographed sigh would be awesome! I can't believe we were unable to meet up with you on Friday. We got a bit of a late start - mainly because we tend to stay up too late with gabbing, laughing, and just general partying when we are at the cabins. We never got to the mountain until 12:30ish and then headed directly to Albannach. (Did you get to see them?) We have a lot of music fans in our group and they spend a lot of time in the groves where the Celtic rock groups play. I was hoping you would decide to join us for dinner on Friday night . . . it was pouring but we still grilled out and ate in. Missed the bonfire for sure but the food and company was delish! Wish you could have joined us. We had our farewell breakfast this morning and there were about 25 people in the cabin. We cleaned up most of the leftovers to add to the eggs/bacon/potatoes/muffins/et al. It was great. Maybe another time I'll get to meet you. I didn't see the point of bugging Angie again by phone just to say "Where are you?" when no one showed up at the place where we had agreed to meet. I did try to leave her a message, but the voicemail cut off after less than 5 seconds and there was no opportunity to say anything meaningful in that amount of time. <shrug>, again. I don't want to belabor the point, but let me just say this: If I try to meet your group at future get-togethers, we need to make a definite time and a definite place to meet, clearly communicated in advance so there is no confusion. I tried as hard as I could to find you all, and it did not work out. That's a shame, but I had a great time anyway, and maybe we will meet up at a future gathering or book-signing. No hard feelings. :-) Catch you some other time. I love your sign! I know I would stop and talk to anyone I saw with a sign like that!